Live chat, lead capture, and feedback. In one intelligent widget. Today, we’re incredibly excited to announce GoSquared Assistant – the scalable way to engage and convert visitors on your website. When you run a store in the physical world, you don’t leave it empty without any store assistants or staff. Visitors to your store always have questions, or small concerns. If there’s no one there to answer those questions, visitors can either leave or choose to buy, with concerns in the back of their mind. The online world seems to ignore the reality of physical shopping – the majority of websites in the world still don’t allow visitors to engage with the businesses behind them. We think that’s crazy. It’s been proven time and time again that if you can be there to chat with your visitors, you’ll be in a far better position to help them and convert them into customers. Live chat is incredibly handy when your business is getting off the ground – getting closer to your customers is critical. As you grow, live chat remains important, but the volume of conversations can be overwhelming. 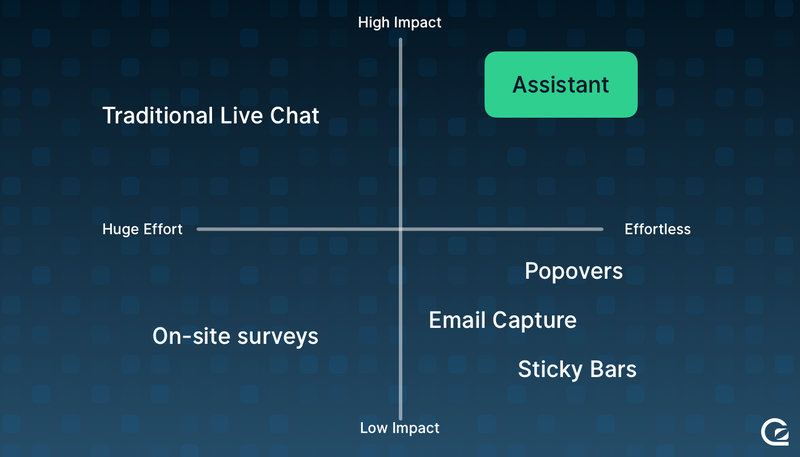 So having the option to enable live chat in a more targeted way – for specific visitors, or on specific areas of your website (like a checkout flow) becomes increasingly important. The future of how businesses engage with customers is messaging – it’s not email, and it’s not phone calls. GoSquared Assistant gives you everything you need to engage with visitors and customers in a friendly and personal way that builds a relationship over time, while ensuring you can be operationally efficient with your customer-facing teams. Your website can be a fantastic source of leads for your sales team. Every visitor to your website is a potential customer. But if you don’t ask for their information, or engage with them effectively, you’ll never be able to turn your visitors into customers. When GoSquared captures an email address for a lead, it will automatically retrieve helpful qualification criteria to enable your sales team to prioritise and engage quickly and effectively. Key information such as company name, size, and industry, the position of the specific person you’re speaking to, and the pages the visitor has been to on the site are all instantly available so your sales team can spend more time closing, and less time digging for information. GoSquared Assistant gives you a powerful and flexible automated messaging system to direct visitors around your site and engage with them at the perfect time. You can use Prompts to ask for feedback from visitors, to start a conversation, or to direct visitors to another page or area of your website. Prompts can direct visitors to your help documentation if they appear stuck, or to leave their details if they look like a promising sales lead. Using the real-time analytics engine under-the-hood of GoSquared, you can set up Prompts to show at the optimum time for visitors based on information such as the page they’re currently viewing, the total amount of time they’ve been actively browsing the site, the referrer that sent to the website, and even their scroll depth on a specific page. As part of GoSquared Assistant, you’ll automatically see real-time insights flow into your GoSquared Analytics dashboards. At the heart of GoSquared is an advanced real-time analytics infrastructure capable of processing billions of requests every day. This infrastructure has evolved over years – it’s been core to GoSquared since the start. GoSquared Analytics shows you every visitors on your website in real-time, with no sampling, so you can see exactly who is on your website, and understand their journeys on a case-by-case basis. You can also see your key metrics rolled up on the Trends dashboard – with a breakdown of your traffic sources, top content, and smart predictions for KPIs. Best of all, GoSquared Analytics requires no setup – just install GoSquared Assistant, and your dashboards will populate with data instantly. The web is plagued with obtrusive banners, modals, and popups that interrupt the visitor’s experience when browsing websites. We’ve always hated this experience as visitors, and as a company we’ve never wanted to inflict that experience on our visitors (and potential customers). While sometimes the numbers may imply a huge modal popping up instantly on page load is a good thing, the numbers often ignore the immeasurable – the actual experience and feeling that visitors get. The feeling of frustration and anger. The feeling of “I’m going to hit the back button”. Our intention with GoSquared Assistant is to lay the foundations for a better experience on the web – one that enables businesses to increase conversion and win customers from their websites, while giving an experience that visitors will engage with and perhaps even enjoy. Our fundamental belief is that you should not need to sacrifice user experience to achieve growth. By using GoSquared Assistant, you can centralise your efforts to increase conversion. When you add a live chat widget, a feedback survey, an email capture popup, and social sharing buttons, all from different vendors, all with different interfaces managed by different teams, it can be enough of a mess for your own company to understand what’s going on. What’s worse, is when visitors hit your site they can receive a totally fragmented and broken experience – with multiple modals, or buttons layered on top of each other. Sites can quickly become ugly, confusing, and down-right frustrating for visitors. By centralising your conversion efforts in GoSquared, you can ensure visitors get a consistent experience that’s been designed to help them. GoSquared does all the heavy lifting so you can focus on your message and intentions, while GoSquared will handle what to show and when, without any conflicts. 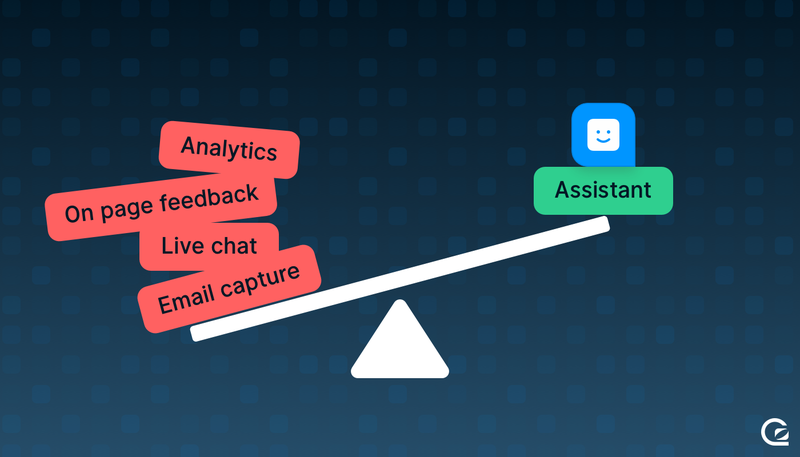 Assistant enables marketing and sales teams to freely experiment with messaging, lead capture, live chat, and more without needing to ask developers every time they want to make a change. Just install the GoSquared Snippet once, and you won’t need to bug the dev team again. We care obsessively about page load times. The trend in recent years has been for websites to add and add and add. Every widget and script adds up. Some websites now have over 20 scripts to load – all in the name of “conversion optimisation”. We don’t believe the answer to increasing conversion is adding more – we believe the answer is to remove and simplify. We’re excited to introduce many more skills and powerful new features for GoSquared Assistant in the future, and we would love your feedback and input on where we take Assistant. GoSquared Assistant is available to try for free today. If you’re an existing customer of GoSquared you can enable Assistant immediately by signing in to your GoSquared account. If you’re new to GoSquared, you can start a trial for free. GoSquared is just $99 / month for all features and unlimited usage after your 14 day trial.